This lack of subsidiary silver coinage created chaos among merchants and bankers who were forced to make change with silver three-cent pieces, heavily worn dimes and half dimes and Spanish fractional silver. As the voice of the people, Congress quickly responded to the complaints of the merchant class, and bills were introduced and fiercely debated for two years before action was finally taken to resolve the problem. Many in Congress were genuinely concerned about "debasement" of the country's silver coinage, the solution most commonly suggested to remedy the situation. The idea of a fiduciary coinage was a new concept at the time, and it was several decades until most Congressmen were comfortable with the idea that a coin need not contain a full measure of precious metal to be a valid circulating medium. 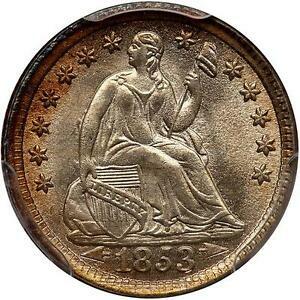 In the 1850s, many inside and outside of Congress considered the idea of fiduciary coinage to be basically dishonest. Perhaps the most ill-informed opponent of fiduciary coinage was future President Andrew Johnson, who called the bill introduced to reduce the silver content of the half dime, dime, quarter and half dollar "the merest quackery" and "charlatanism." However, after two years of postponements and three consecutive days of debate, the bill authorizing a weight reduction of 6.9% in these silver coins was signed into law February 21, 1853. 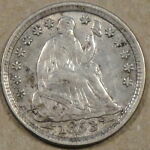 Much depended on the new coins entering the channels of commerce as quickly as possible. Officials agreed that the new, lower weight coins should have some distinctive design or mark that would enable the general populace to easily distinguish them from the earlier Gobrecht-Hughes designed Seated Liberty coinage that contained a greater amount of silver. Even Congress recognized the need for the new coins to have a modified design, and the following month a law was passed that authorized the Mint to temporarily employ such artists as would be needed to alter the dies for the coins affected. But Chief Engraver Longacre knew that the press of time would not allow any drastic redesigning or the hiring and training of outside artisans. All there was time to do was hand punch arrowheads on either side of the date and add a "glory" of rays on the reverse dies of the quarter and half dollar. With only this minor change in design, the grading parameters remain the same as for the earlier issues. On the obverse, check the high points of the breast and knee for wear; on the reverse, the ribbon bow and tips of the leaves. More than 13 million Arrows half dimes were struck in Philadelphia in 1853, more than half the total output of 25,060,020 for the three years arrows were used. Only Philadelphia and New Orleans produced the issue, and the New Orleans pieces are significantly scarcer than their Philadelphia counterparts. Proofs were struck in all three years but are of the utmost rarity. Arrows half dimes are easily collected in all but the highest grades. There are no real "stoppers" in the three-year set, but the New Orleans coins are considerably more elusive and expensive than those from the Philadelphia Mint. 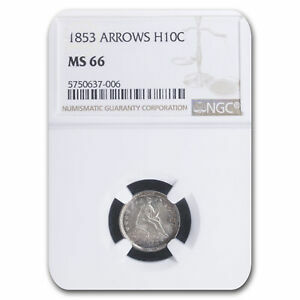 For decades coin dealers would not stock low grade Arrows half dimes because they were considered so common. This disdain carried over to higher grade coins as well, and it has only been in recent years that type collectors have elevated this series to respectability because of the need for gem coins for type sets (few of which had survived). As one might expect, the wholesale removal of all pre-1853 silver coins did create several rarities, and in the half dime series 1853-O Without Arrows is a significant rarity that has sometimes been counterfeited by altering an 1858-O coin. 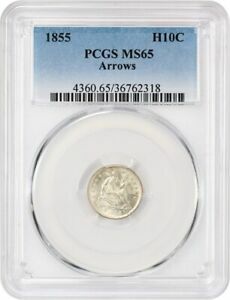 In 1856, after three years with arrows on either side of the date, the half dime was returned to its pre-1853 design, but with the new reduced weight. It remained unchanged until 1860. The Mint Act of 1853 achieved what Congress and the Mint set out to do; it reduced the amount of silver in the subsidiary coinage to a level where it was not profitable to melt, hoard or export these denominations, and small change circulated once again. The Act also established a fiduciary coinage in the United States for the first time. 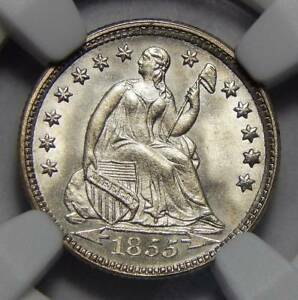 However, the profit the Mint made on the production of these coins (or seignorage as it is known) was minimal, and rising silver prices through the remainder of the 1850s made the Mint's profits less and less. By the time of the Civil War, so little was made on the production of silver coins that it looked as if melting and exporting would resume if the silver price continued to climb. Hoarding did indeed occur, but not because of rising silver prices. Rather, Arrows half dimes and all silver coins were hoarded during the Civil War simply because the coins had silver in them in any amount, this was how great uncertainty was on the part of the general populace regarding the outcome of the War. 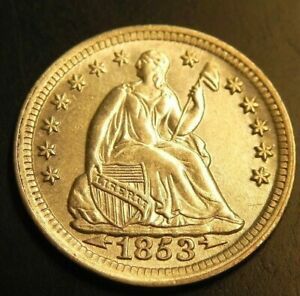 The issue of fiduciary coinage would be debated for the next century, but it was the Arrows coinage of 1853-55 that fired the opening shot in the controversy that was not fully resolved until all precious metal was finally removed from circulating coinage in 1970. Carothers, Neil, Fractional Money. A History of the Small Coins and Fractional Paper Currency of the United States, John Wiley & Sons, London, 1930. Taxay, Don, The U.S. Mint and Coinage, Arco Publishing, New York, 1966.